An earlier post discussed the range of labels available at Costco. We now turn to the Kirkland label. Costco’s Kirkland Signature label first appeared in 2003. To summarize Mike Veseth (http://wineeconomist.com/2007/08/22/costco-and-global-wine/) there appear to be three basic models for wine marketing that correspond to the three largest wine import markets: the US, Germany and the UK. The German model is about low prices and seeking value, and the average bottle retails for about a Euro ($1.37) a liter (note: in the US a typical bottle of wine is three-quarters of a liter), with the seller’s reputation carrying the day. The UK is the most important wine import market in the world and the British consumer has access to wine from every part of the globe. To reduce confusion, the major chain stores like Sainsbury’s and Tesco’s have their own brands such as Tesco’s Reka Valley Bulgarian Cabernet Sauvignon (see: http://tinyurl.com/4tcss92, a steal at $34.23 at (current exchange rates) for a case of 6 bottles), which give consumers the confidence to try new wines. In the US we certainly find many overcrowded and confusing wine retailers with a plethora of brands, varietals, regions, and ratings. However, we also find the German system at a retailer like Trader Joe’s with it’s Two Buck Chuck, and Veseth states that Costco’s innovation might have been to introduce the British system to the US through it’s Kirkland brand. MadisonWineScene (MWS) recently interviewed Merrell Tomlin, wine steward at the Costco in Middleton (2150 Deming Way) about the Kirkland label. MWS: Tell me more about Costco’s Kirkland label. Merrell: Costco goes to a highly rated vineyard, and like Cameron Hughes (http://www.chwine.com/), we take the vineyard’s excess product off their hands and put it under the Kirkland label. We sign a non-disclosure agreement that does not permit us to disclose the source of our supply. We sell that wine under the Kirkland label. This results in three things: it will always be an incredible wine, it will always be an incredible price, and it will always be a limited supply. We may buy 500 cases and each Costco store gets one, or we may buy 5000 cases and every store gets a pallet. It depends upon what deal is struck and what their comfort level is. Since these deals with highly rated vineyards depend upon what good opportunities we see out there, there is no guarantee that what we have this year will be the same as what we had last year. Sometimes the maker does allow us to identify them. For example on the non-wine side, for the last two years we have had an 18-year old and a 16-year old port-finish Scotch, which says, “made exclusively for Kirkland by Macallan”. I got an allocation of four cases of each. 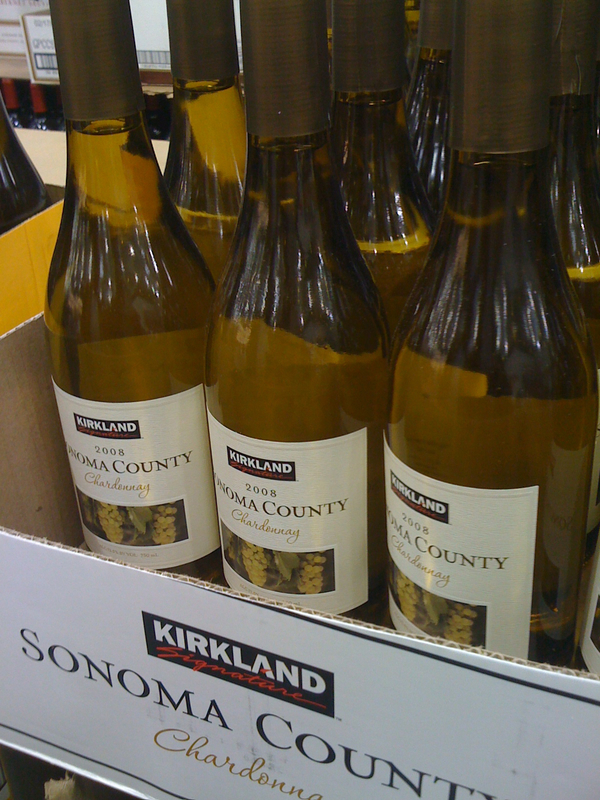 Costco sells three levels of the Kirkland wine label. The entry level usually relates to the varietal, for example a Kirkland Sauvignon Blanc. The next level usually specifies a region, for example a Kirkland Sauvignon Blanc from the Marlborough region of New Zealand. The top level is the Kirkland Signature label which will always be a high quality wine and it will usually specify an area within the Marlborough region. Naturally, as you go up in quality of the Kirkland label, the quantities get less. The rule of thumb is that if you take the retail price on any of our Kirkland labels and double it, then that’s the level of wine it is comparable to. Last year we had 14 different Kirkland offerings – Pinot Grigio to Pinot Noir to Cotes du Rhone, Chateauneuf-du-Pape, a bunch of Cabernets, Meritages, Merlots. We start the offerings in February and this last year we sold out of the last of our offerings in November – with the exception of the Kirkland Chardonnay, which we offer year-round. Currently, we have two great Kirkland red wine offerings available: a 2008 Amador County Grandmere Old Vine Zinfandel for $11.99 and a 2009 Mendoza Malbec for $7.99. There is a learning curve going on in Madison about Kirkland wines – since we ran out of our last reds around Christmas, people have been coming back asking for more. We have only been here a few years and people are still learning to shop Costco. It is not a traditional store. What I tell a person is: “Try it -- if you like it, come back quickly, because it is a one-shot deal.” People who have been Costco members for a while know the value of the Kirkland brand and will usually just go ahead and buy a case. More details about Costco's worldwide wine, beer and spirits operations can be found at http://bit.ly/lWqPLS.